What will my fellow travelers be like? First of all, the tour programs designed by Coda International Tours are different from all other tours being offered to the gay market. They are destination focused and appeal to men and women who go on vacation to relax, have fun and be enriched by the experience of being exposed to foreign cultures and people. All with style and sophistication. Your fellow travelers are gay men and women who choose to travel together for the camaraderie and sense of belonging it generates. So to answer the question, Coda travelers are interesting and interested. They vary in age from early 40's to late 60's with a few younger and a few older. Ageism is never an issue on our trips. I travel as a single. Will I feel out of place? The gay market is inherently singles oriented. All of our tours are a combination of couples and singles. You will never feel out of place. Will Coda find me a roommate? We will pair you up with another traveler who also expresses interest in sharing if one is booking the same trip. We cannot guarantee that there will always be a share possibility but often there is. Are there women travelers on your trips? We often have women travelers on our trips and they have a great time. By and large our trips our male-dominated, but we are thrilled when our Lesbian sisters book and travel with us. I have never traveled with a gay group before. Is it safe? Our clients are sophisticated travelers who understand that there are many cultures, religions and philosophies around the world. Not all of them are as open to our lifestyle as western cultures – at least not yet. We rarely attract any type of unusual attention as a group anywhere we go. Our overseas partners are all fully aware that we are a gay group and, when traveling in countries where some form of discretion might be advised, they take every step possible to assure our safety. That said, there are very few places in the world where gay people are not at least ignored as the worst form of insult. Open expression of homosexuality (hand-holding, kissing in public, etc.) is frowned on in many parts of the world – including in most parts of the United States. Will the atmosphere be too sexually charged? Our desire is not to run party-trips, and most of our clients are traveling with us because they want to see the world with other gay people – not just hook up or be in a floating gay bar while on vacation. But there is always the possibility you will meet Mr. or Ms. Right and what you do about it is your own personal business. What makes Coda different from other companies? In a word – STAFF. Few companies have the level of travel experience among their staff that Coda does. Each one of us has traveled extensively worldwide, and we bring that experience to our planning, operation and execution of our trips. It is one thing to be able to choose a luxury hotel to stay in; it is another thing to know how to design the sightseeing to extract the essence of a destination. It's not what you know. It's whom you know! We have friends in virtually every corner of the planet, and that is what makes a travel company stand out. What assurance do you provide to protect the traveler's investment? • Purchase trip cancellation insurance for all or part of your trip. Would I be able to correspond with a past traveler of Coda? Absolutely! Just let us know, and we will put you in touch by e-mail with one or more of our frequent travelers. Yes. We will send you an application form for trip cancellation and interruption insurance when you book with us. You can also purchase your insurance on-line on our page. We highly recommend that you insure yourself against unexpected cancellation. Do you arrange for air transportation? At your request we will provide you with an air quote for the trip that you are booking. We also have access to some very attractive business class fares. Do I have to make my air arrangements through Coda? Not at all. The reason we do not include airfare in our trip cost is to allow you the flexibility to go and come when and how you please. Many of our clients use frequent flyer miles or make pre and post trip plans that they prefer to control themselves by booking their own air. Do you arrange pre- and post-trip plans? Yes. We will arrange pre and post trip plans to any destination you wish. Do you arrange customized trips for singles, couples or small groups of friends? We will be happy to customize a trip for any number of travelers. We will arrange 4- and 5-star trips to any destinations in the world. We require a $200 non-refundable research deposit to initiate the arrangements, which is applied to the final cost of the trip if you decide to take it. Who will lead my trip? We are proud to have some of the best, experienced tour managers in the business working for us. And they are gay, too! They are there to assure a worry-free trip, full of fun and learning for you. Are the guides overseas gay? 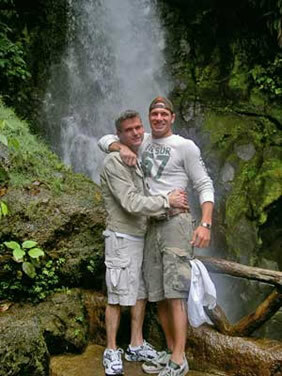 We prefer to secure gay guides wherever we go since this allows us to view their country from our natural perspective. However, it is not always possible to find "out" gay guides since in many countries the guides would risk exposure they do not want if they spoke up. But we do speak frankly and openly with our overseas partners and all of our guides are required to know something about the local gay culture – whether they live in it or not. Will I feel like I am being herded? We hope not! We do organize touring in the classic sense, with tour guides and busses, but we want you to feel comfortable doing as much as or as little as you wish with the group or on your own. The option is always yours! We accept MasterCard, Visa & American Express for deposits and require final payment by personal check. If you wish to pay final payment by credit card, this may be arranged with the additional of a 3-5% surcharge. 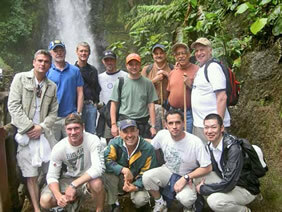 Coda is a leader in small group luxury travel for the gay and lesbian market. We have been creating unique journeys around the world since 1998 driven by the idea that cultural enrichment inherent in travel is much more fun when shared with like-minded traveling companions. 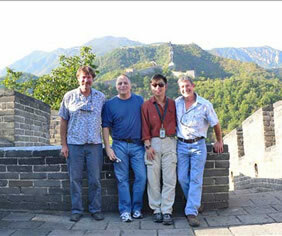 Our escorted small group trips are created for gay travelers who seek an all-inclusive travel experience where everything is carefully planned and executed, where as much ground is covered as is comfortably feasible at a reasonable pace and in relative comfort, and where your traveling companions will be individuals who share your sense of wonder at the world. We stay in carefully selected hotels, sample the authentic tastes of the local cuisine, enjoy introductions to fascinating local people and make discoveries of hidden gems that only come with talented guides and years of experience. We design our trips to capture the best of a particular destination. Our trips are built around the cultural hubs and highlights of the world, places everyone should visit at least once in his life, and the style of travel is elegant without being opulent; refined without being pretentious; and insightful without being tiresome. We pride ourselves on our cutting-edge knowledge of destinations, resulting from continuously traveling around the globe. We endeavor to bring new and exciting destinations to our loyal clients every year while offering the tried-and-true, best-loved destinations for new clients who are constantly joining our coterie. The strength of our staff is in the number of years each has spent traveling extensively around the globe. We have held positions as international tour managers, cruise directors, expedition leaders and executive travel planners for America's leading educational, scientific and cultural institutions and museums. We have circled the globe on luxury ocean liners, Concorde jets and stayed in the world's grandest palaces and simplest huts. Between us we speak 6 languages and have traveled to more than 75% of the countries in the world. We are working on the remaining 25%. 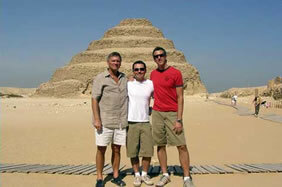 We like to know our clients personally and travel with our groups whenever possible. 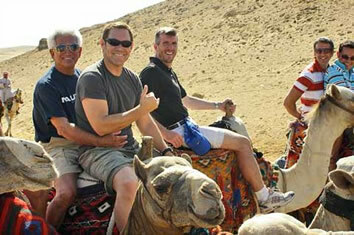 We consider our clients friends and enjoy socializing beyond traveling with you. Travel with us and discover why our clients return over and over (more than 60% repeat clientele on every tour) and why we have won accolades from Out & About newsletter and major gay travel publications. The small group tours designed by Coda International Tours are destination focused and appeal to men and women who go on vacation to relax, have fun and be enriched by the experience of being exposed to foreign cultures and people — all with style and sophistication. Your fellow travelers are gay men and women who choose to travel together for the camaraderie and sense of belonging it generates. Coda travelers vary in age from early 40's to early 70's with a few younger and a few older. Groups are always composed of a mix of singles & couples. Feeling part of the group & ageism is never an issue on our trips. We operate our trips on as few as 2 travelers to a maximum of 18 (unless otherwise stated.) We do all possible to avoid cancelling a scheduled trip.